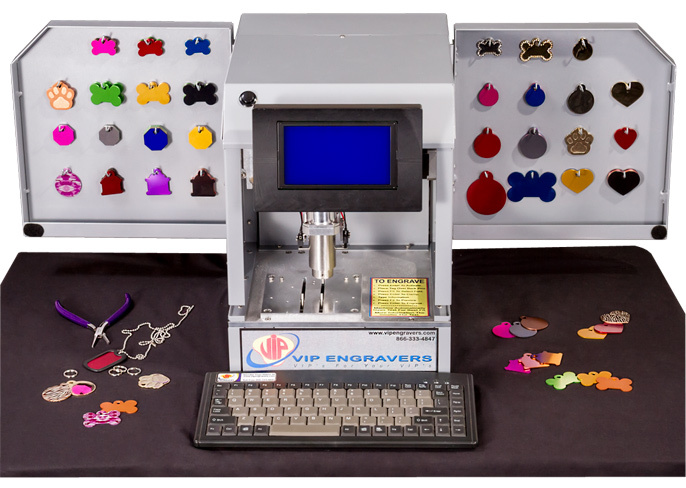 The Patented VIP CE-1000 computerized engraving system was engineered for durability and designed for ease of use, virtually eliminating the need for any field maintenance and employee training. Just plug it in and your ready to go! The LCD screen is bright and easy to read and the easy to follow on-screen instructions make operating the system so simple that even your customers can engrave an item. The patented and innovative automatic clamping and tag identifying features of the CE-1000 make engraving a breeze. These features eliminate the need to manually identify the item to be engraved, and also eliminate the need to purchase and store costly and often lost tag-holding jigs that are required by other systems. The CE-1000 also boasts a unique overhead gantry design allowing the engraving table to remain stationary preventing the common pinching hazard when the tag is ready to be removed. This feature provides an extra level of safety for you, your employees and your customers.